Tourists who have made multiple trips to Southeast Asia know the drill: sunbathe and frolic in the beaches, sample the street food, mingle with the locals, and shop. 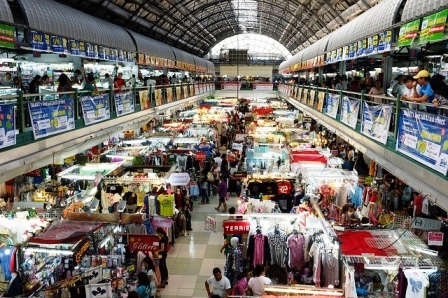 Though people will swear by the great shopping in Europe or the US, when it comes to bargain finds, nothing beats Asia. In the Philippines, Manila is a place that every tourist should check out for amazing bargain finds. Here, you’ll find the latest fashionable clothes and accessories that will make girls (and sartorially-savvy guys) come back for more. There are a lot of malls, bazaars (or tiangge, as known in the country) and markets that are simply overflowing with the hottest trends of the season, and you can go and stock up on shoes and bags without causing massive damage to your wallet. Bring some reusable bags or eco bags with you. Some parts of Metro Manila have banned the use of plastic bags, and purchased items are usually placed in flimsy paper bags. Bargain like mad. There is such a thing as a “tourist price” in tiangges, so if you can bring along a Filipino friend, have that friend bargain for you. If you’re shopping alone, aim to pay at least 30 to 40 percent lower than the price that was mentioned. Bring an umbrella to shield you from the strong rays of the sun or to protect you from sudden downpours. On a recent trip to Greenhills, I wanted to see how much stuff I could get for 5,000 pesos, or roughly about $113. My goal was to get a few clothing items, a pair of shoes, a bag, and maybe some accessories if I have anything left over. Knowing that I needed to buy the big ticket items first, I went to the lanes selling bags and shoes. The bag lanes are just crazy! Here, you’ll find all sorts of brands, from Louis Vuitton, Chanel, Prada, and Gucci to Burberry, Michael Kors, Hermes, and Balenciaga, among others. Bags are classified as Class A, triple Class A, and Quadruple A. The grading system is based on how good a copy a bag is. The Class A ones will be the cheapest among the bunch. They are decent looking replicas, but the mark of a good copy of an item is all in the small details. The triple and quadruple A bags are the best bags, quality-wise, and if you’ll look at them closely, it is quite impossible to tell whether you’re looking at a fake or the real thing. The Quadruple A Hermes Birkin bag was priced at 25,000 pesos, which is definitely out of my budget. But upon checking out the other stalls, I saw a triple A Louis Vuitton Speedy bag at only 2,000 pesos. I haggled and managed to bring down the price to 1,700. Score! Next on the list was a pair of pretty, locally-made flat shoes at a fixed price of 700. That left me with 2,600 more. I managed to get three blouses for 1,000, then a dress for 600 pesos. Finally, I got two shirts for 500 pesos, and a nice pair of “Ray Ban” triple A aviators for 500. All that for just a little above $100! 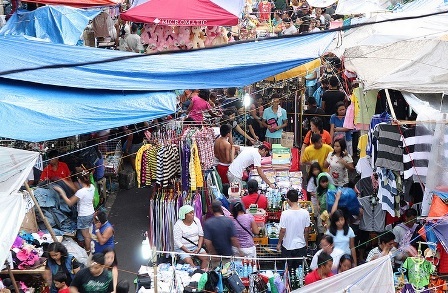 Compared to Greenhills, Divisoria is more chaotic, more crowded, and will prove to be a lot more confusing to those who aren’t used to the area. 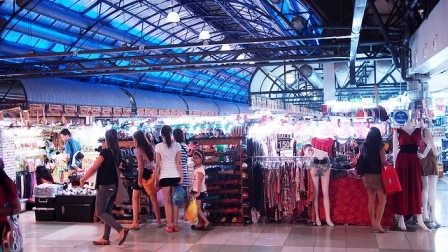 Divisoria is composed of streets and alleyways filled with merchandise, malls, and airconditioned bazaars all together in the heart of Manila, near Chinatown. If you’re squeamish, unused to crowds, and can’t bear the idea of dodging small vehicles and horse-drawn carriages, then you probably won’t appreciate this place too much. But if you’re after a good bargain, then this is the place to be. The quality of the merchandise here may not be the same as the things you’ll find in Greenhills, but the prices are definitely cheaper. Divisoria is also a great place to go to for buying things in bulk, since you can get a cheaper price for the whole lot than if you were to buy just one or two pieces. Say you’re looking for plain cotton shirts which you’ll use for party favors or corporate giveaways. For that, you need to go to Ongpin Street, where several stores are offering shirts of all colors for wholesale prices. Imagine getting one shirt for less than $2.00! Amazing, right? For tropical fruits such as mangoes, papayas, pineapple, watermelon, and bananas, the streets to visit are Asuncion and El Cano streets. Fruits are cheap here compared to buying them at the grocery. In fact, a kilo of the world famous Philippine mangoes cost as low as 70 pesos per kilo. Prices depend on whether the fruits are in season or not. Some of the vendors will even let you taste the fruit before you buy. For clothes and bags, head on over to 168 Mall, New Divisoria Mall, or Juan Luna Street for the cheapest and best stuff. All over Divisoria, there are street carts that sell clothing, but don’t even think about getting your clothes there if you’re looking for good quality. At 168 Mall, class A knock-offs of Polo, Ralph Lauren or Lacoste shirts can be had for about $8.00 a pop. Class A bags are as low as $15, depending on the size and brand. If you’re looking for toys or party favors, the best place to find these things is at New Divisoria Mall. Some loot bag items go as low as $0.11, so it’s possible to get a lot at these low prices. Whether you like the atmosphere at Greenhills, or whether you prefer to dive in the chaos of Divisoria, remember to haggle, be polite, and watch your belongings. Indeed, shopping is more fun in the Philippines!